CHIPOJO LAB: Grass anole superstars. Greetings from the west side of Puerto Rico! I’m almost two weeks in conducting my studies on the Puerto Rican grass anoles: Anolis pulchellus, Anolis krugi, and the hybrids that have arisen from the two species via mitochondrial introgression. 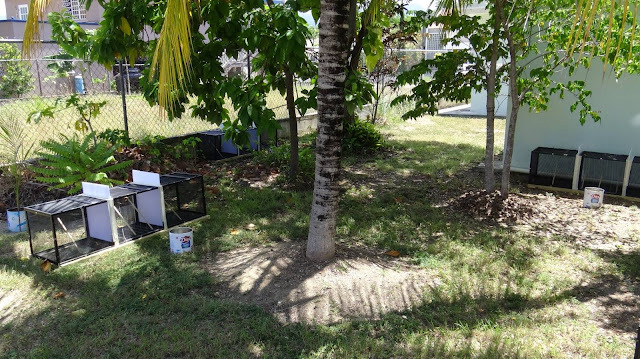 Considering how these hybrids, which look practically identical with pure Anolis pulchellus with the naked eye, seem to have swept through west coast of the island I’m really interested to find out if these two groups would still mingle between themselves if given the opportunity. So I decided to host my own lizard dating show – a sort of “The Anolis-Bachelorette” except these bachelorettes don’t get a whole season for themselves but an episode. Combining three cages into one, I built enclosures with three partitioned sections. Placing a female in the center, and a male on each end, she’ll be given the opportunity to view both a male of her own group and a male of the other all while I record the whole session. 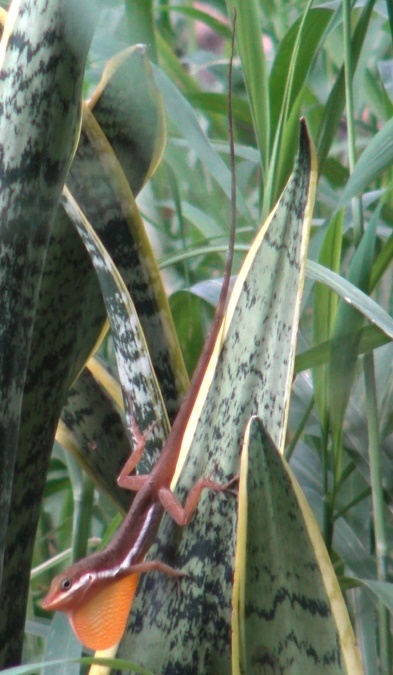 The first season of the Anolis-Bachelorette are between pure A. pulchellus and A. krugi. Multiple enclosures to record multiple "episodes" because who doesn't love binge-watching?! The white foams boards are in place during the acclimation period and are pulled out upon the start of the recordings. Those tin soda-crackers cans are in place as the mounts for each of my video cameras. Because these bachelorettes only get one “episode” the show requires a lot of participants! So between episodes, I’m going out on frequent casting calls at different sites on the island. One day, in particular, I was in search of specific site to find A. krugi through the windy, narrows roads of the mountains of Peñuelas. En route, my GPS lost signal but stubbornly didn’t want to admit it as it was just taking me in circles. After realizing this, I retreated from the high hills. But on my way back to the studio, my peripheral caught a glimpse of a beautiful, unfenced stretch of grass at the edge of the forest. I stopped to explore this narrow field and low and behold it was teeming not just with A. krugi but also mitochondrial-hybrid A. pulchellus both living in densely-populated harmony. The find definitely made up for “lost” time. Ha. Ha. A grass anole (researcher's) oasis! After casting the anoles in the dating show I bring them right back to their nice homes. In addition to running a dating show, I was also in the works of gathering scenes for a talent show! More specifically, I’m gathering video recordings of display behaviors by both groups of A. pulchellus and of A. krugi. With evidence that hybrids can produce signals that are either mixed or novel in reference to the parental species, I’m curious to see if these mitochondrial hybrid grass anoles possess signaling traits that differ from there parental groups. 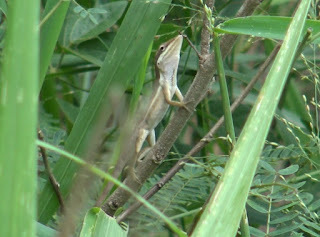 So I’m out to find male anoles willing to show off their pushup style-dewlap pulsing dance moves. These guys can be pretty elusive as it seems most of them don't want to come out of hiding to seek fame. Screenshot of an A. pulchellus mitochondrial hybrid in mid-pushup.